Douglas B. Johnson is a lifetime Tulsa resident who is proud to continue residing in Tulsa with his wife and children. 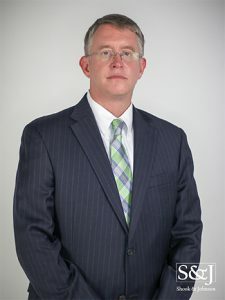 Mr. Johnson is a graduate of Jenks High School, the University of Tulsa, and the University of Tulsa College of Law. Mr. Johnson is a general civil attorney whose practice is primarily limited to business law, employment law and estate planning. With respect to business law, Mr. Johnson is particularly focused on transactional law, which includes the drafting and negotiation of written instruments; including business sale agreements, real estate transactions and corporate governance documents. Since 2001, Mr. Johnson has participated in business transactions approaching one billion dollars working with closely held and publicly traded companies in the United States and abroad. With respect to employment law, Mr. Johnson is particularly focused on the review of personnel policies, employment agreements, severance agreements, non-compete and non-solicitation agreements. Mr. Johnson’s years of experience working with Mr. Shook on plaintiff’s employment law cases has provided Mr. Johnson with valuable insight to advise corporate human resource professionals as well as sole proprietors regarding the maze of employment laws. With respect to estate planning, Mr. Johnson is well-versed on matters of estate planning, estate protection and estate administration, whether you need a simple will or a complicated estate structure to minimize tax consequences. Every individual’s circumstances require specific analysis to determine the most appropriate estate planning strategy. Contact Mr. Johnson to discuss your specific estate planning needs. Super Lawyers, Rising Star, 2010.